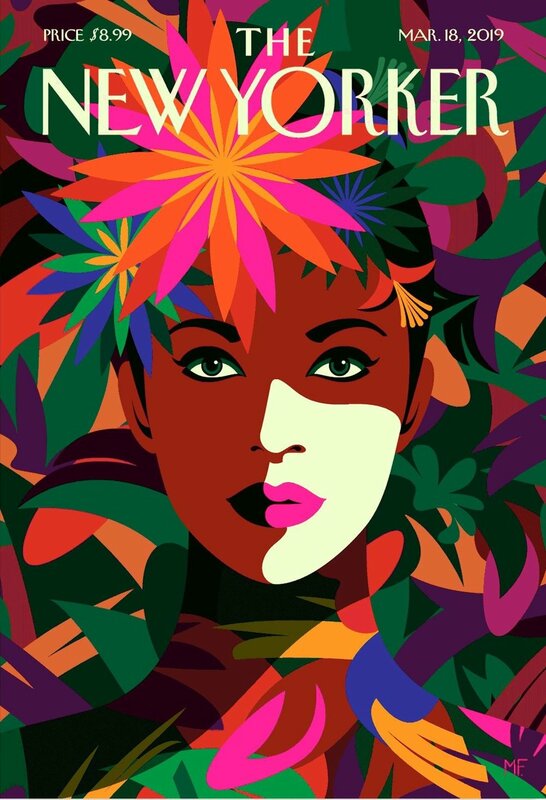 Illustrator Malika Favre’s latest project is the cover art for The New Yorker’s Spring Style Issue, and it’s a beauty. For Frida Kahlo lovers, Favre’s references are unconsciously obvious in ‘Spring to Mind’, her seventh cover for the magazine. Interviewed by Françoise Mouly, Favre explains how her minimalist style exploded into an effusion of color and floral shapes. The inspiration was Frida Kahlo’s iconic look. I wanted to retain the energy and vibrancy of her paintings and the strength of the woman herself, hence the looser strokes and the explosion of color. This cover may be flamboyant, and it does use organic shapes, but it’s still in tune with my aesthetic approach. My work has a lot to do with colors and shapes, and this piece is another way to experiment with combining those things. The use of Frida Kahlo inspiration for the New Yorker also relates to a new exhibition at the Brooklyn Museum. The show is not a major exhibition of Kahlo’s paintings with only 11 out of more than 350 objects. Rather ‘Frida Kahlo: Appearances Can Be Deceiving,” is a recapitulation of her life through personal possessions — her clothing, jewelry and favorite objects. The selection of the rich skirts and blouses from the Oaxacan city of Tehuantepec and her statement jewelry that were so key to Kahlo’s substantative style are intrinsically embedded in her art.